If you like animals, you want to help and have some free time, be a volunteer in our kennel! An aid, no matter how small te amount, its always an indispensable and welcome aid. Make some of your free time, during the week or at the weekend, available to help our Association. 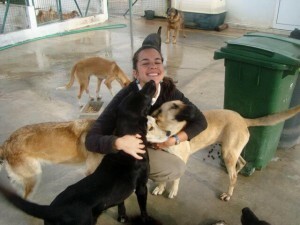 - Or just providing a dog walk or giving love and affection to our animals. At JAVA we are all volunteers and depend on all the support that others want to offer us. Our kennel is open every day from 9:30 a.m. to 12:30 p.m. including Saturdays, Sundays and holidays. Meet some of our volunteers here and know a little more about them and the day-to-day life of our shelter. Contact us and visit our shelter. We wait for you, they thank you!